Take gode broth and do in an erthen pot, take flour of payndemayn and make þerof past with water, and make þerof thynne foyles as paper with a roller, drye it harde and seeþ it in broth. Take Chese ruayn grated and lay it in disshes with powdour douce, and lay þeron loseyns isode as hoole as þou myȝt, and above powdour and chese; and so twyse or thryse, & serue it forth. The Forme of Cury 89. Take good broth and put it in an earthen pot, take quality white flour and make thereof paste with water, and make thereof thin foils as paper with a roller, dry it hard and seethe it in broth. Take semi-hard cheese grated and lay it in dishes with sweet powder, and lay thereon noodles sodden (boiled) and as whole as thou must, and above powder and cheese; and so twice or thrice, and serve it forth. The text of the original recipe comes from Curye on Inglysch, edited by Constance Hieatt and Sharon Butler. This is fast becoming a personal preference over the more familiar macaroni and cheese! A dish like this would most likely have been served at the end of a feast, as it was believed that cheese closed off the stomach and forced the food in the stomach to digest faster (Scully, 1995, 134-135). This was particularly true of fresh, semi hard cheeses. The name “Losyns” probably derives from Lozenge (Renfrow, 1997, 266). This was a traditional shape for medicines, which further suggests this was as much a medicinal dish as a culinary delight. In a wide pan, bring the stock to a boil and cook the lasagne noodles according to the instructions. You will probably find two spatulas useful to get the lasagne noodles out of the stock. Keep the stock boiling. Lay the lasagne noodles on a damp cloth, and cover with another damp cloth, while you are assembling the lossyns. Mix together the cinnamon, nutmeg and sugar (if using) and set aside. Put a good layer of cheese in a bowl big enough to accommodate the noodles without cutting them, and sprinkle on some of your spice mix. Lay a lasagne noodle on top of the cheese and spices, and put more cheese and spices on top. Repeat with the rest of your lasagne noodles, ensuring you finish with cheese and spices. Gently pour some of the stock over the top of the lossyns, to melt the cheese. Leave to cool slightly. Cut the lossyns diagonally, so you end up with diamond shapes. Carefully ease the individual pieces onto a serving platter. You can serve them hot or cold. “Flour of paynedemayn” is the best quality white flour (Butler and Hieatt, 1985, 204). If you are going to make your own pasta, use quality flour recommended for pasta, as the cheap stuff won’t give good results. 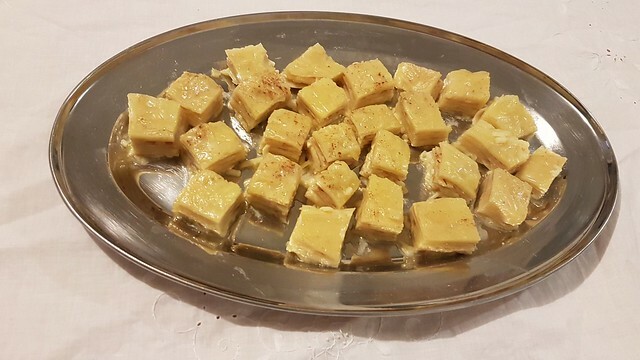 “Chese ruayn” is autumn cheese, made from the milk produced after cattle had fed on autumn growth. It is thought to have been a semi-firm cheese (Butler and Hieatt, 1985, 211). A Cheshire style cheese would be ideal; it is thought this style of cheese making came about in the late medieval period, and Cheshire was one of the first regions in England to produce cheese on a commercial quantity (Kindstedt, 2012, 165-172). “Powdour douce” is a sweet spice mix, as opposed to a “powder fort” (strong powder). It is likely each cook had their own preferred blend, though cinnamon and sugar are thought to have been common ingredients (Butler and Hieatt, 1985, 208). My preferred blend is 2 parts cinnamon to one part nutmeg, sometimes with 2 parts sugar added. The suggestion to pour boiling stock over the lossyns comes from Pleyn Delit. However, that recipe specifies just a half-cup of cheese… which hardly seems worth it! (Hieatt et al, 1996, 12). Hieatt, Constance and Butler, Sharon (1985). Curye on Inglysch. Hieatt, Constance, Hosington, Brenda and Butler, Sharon (1996). Pleyn Delit. Renfrow, Cindy (1997). Take a Thousand Eggs or More, vol. 1. Tak clene whete and braye yt wel in a morter tyl þe holes gon of; and seþe it til it breste in water. Nym it vp & lat it cole. Tak good broþ & swete mylk of kyn or of almand & tempere it þerwith. Nym ȝelkes of eyren rawe & saffroun & cast þerto; salt it; lat it nauȝt boyle after þe eyren ben cast þerinne. Messe it forth with venesoun or with fat motoun fresch. The Forme of Cury 1. Take clean wheat and smash it well in a mortar until the hulls are gone, and boil it in water until it bursts. Take it up and let it cool. Take good broth and sweet cow or almond milk, and mix it therewith. Take yolks of eggs and saffron and cast thereto, and salt it. Do not let it boil after the eggs be cast therein. Serve it forth with venison or fat, fresh mutton. Frumenty, or furmenty, was a staple of medieval kitchens. As the recipe above suggests, in England particularly it was served with venison. It does make an excellent accompaniment to any meat dish with a good sauce, as the frumenty absorbs the sauce well. 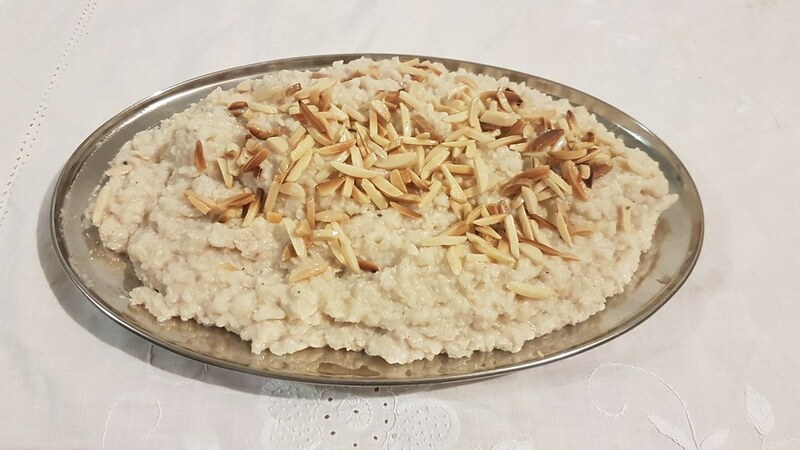 It is a very filling dish, and can be made sweet with the addition of sugar and dried fruits. Put the bulgur, stock, milk and saffron in a pot and bring to the boil. Reduce the frumenty mix to a simmer, and cook until most of the liquid has been absorbed (this will take around half an hour). Stir it occasionally to ensure it doesn’t stick. Keeping the heat very low, add the egg yolks and salt and stir well to heat through. Can be served hot, or at room temperature, as an accompaniment to a meat dish or a side dish by itself. 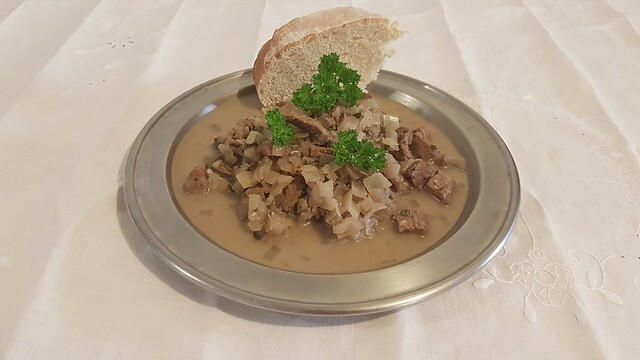 This recipe is very similar to the one found in Pleyn Delit (78). 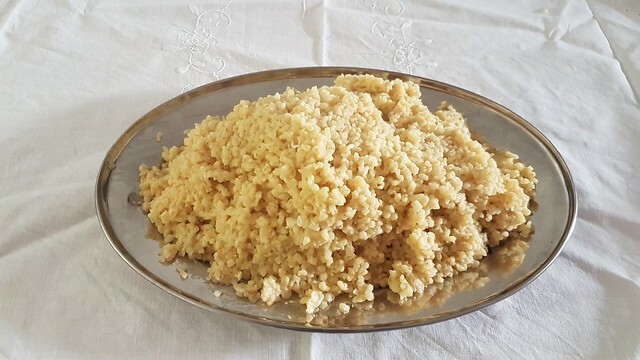 Bulgur is made by crushing and boiling wheat grains – thereby eliminating a lot of pounding wheat in a mortar. Frumenty could also be made with barley (Hieatt et al, 1996, 47). The bulgur will swell to at least four times the size when cooked – remember to take this into account when menu planning. The “fresh mutton” mentioned in the original recipe refers to recently butchered mutton, rather than salted, preserved mutton. If your frumenty is too sloppy, you are probably using too much cooking liquid. It’s better to use slightly less and top up if in doubt. Take Veel oþer Moton and smite it to gobettes seeþ it in gode broth. cast þerto erbes yhewe  gode wyne. and a quantite of Oynouns mynced. Powdour fort and Safroun. and alye it with ayren and verious. but lat not seeþ after. The Forme of Cury 18. Take veal or mutton and smite it into gobbets. Seethe it in good broth. Cast thereto chopped herbs and good wine, and a quantity of minced onions, powder fort and saffron, and thicken it with eggs and verjuice. But let it not seethe after. Veal was eaten most commonly in the spring, as part of the end of Lent (Wilson, 2003, 88); households with the means and inclination would slaughter at least one male calf in the spring to obtain rennet for cheese (Wilson, 2003, 151). Mutton could be obtained at any time of the year, but is quite hard to find today. If using veal, remember it is quite lean and in general will not need much cooking. Shred the veal, and finely slice the onions. Put the stock, wine, meat, onions, herbs and spices into a pot and bring to the boil. Simmer until the meat is cooked. Whisk together the eggs and the verjuice. Add a ladleful of the pottage liquid to the egg mixture, and whisk in. Remove the pottage from the heat, and add the egg mixture. Stir well to completely incorporate the egg and cook it. “Powder fort” is a spice mix that translates to “strong powder.” Hieatt and Butler suggest pepper and cloves (Hieatt and Butler, 1985, 208-209). I used a mix of sage, oregano and thyme in the pottage. These are all herbs that can stand being cooked without losing their flavour, go well with beef and were available in period. Adding a ladleful of stock to the eggs before adding the eggs to the pottage brings the temperature of the eggs up and ensures they won’t curdle when added to the pottage. As the recipe specifies, DO NOT LET THE POTTAGE REBOIL AFTER THE EGGS ARE ADDED. This would cause the eggs to curdle and split rather than incorporating into the pottage broth. If you are lucky enough to find mutton, it will probably need to be cooked a lot longer to make the meat tender, as mutton comes from older sheep. Wilson, C. Anne (2003). Food and Drink in Britain. 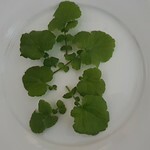 Pill garlec and cast it in a pot with water and oile. and seeþ it, do þerto safroun, salt, and powdour fort and dresse it forth hool. The Forme of Cury 77. Peel garlic and cast it in a pot with water and oil and seethe it, do thereto saffron, salt, and powder forte and dress it forth whole. Garlic as a side dish! 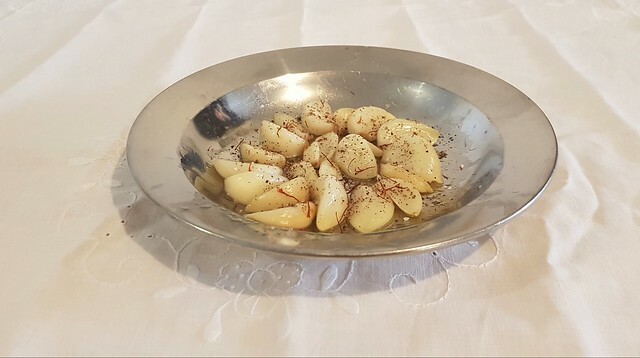 Foods such as garlic were regarded primarily as peasant food, however the presence of oil (presumably olive oil), saffron and the spice mixture powder fort makes this super luxurious garlic. You might be concerned about eating whole garlic, however boiling the garlic removes the enzymes that give it the sharp taste and cause the garlic breath. It becomes very soft and quite sweet. Break apart the garlic bulbs into individual cloves, and peel them. Put the garlic, oil and water into a pot, and bring to the boil. Cook the garlic until it is soft, around 10 minutes. Strain the garlic, arrange on a platter and sprinkle over the spices and salt. To make this more luxurious, you could use chicken stock to cook the garlic. I suspect the original recipe specifies water to make this recipe suitable for fish days. Take erbes, boile hem, hewe hem and grynde hem smale. Take almaundus iblaunchede; grynde hem and drawe hem vp with water. Set hem on the fire and seeþ the iowtes with the mylke. and cast þeron sugur & salt, & serue it forth. Take herbs, boil them, hew them and grind them small. Take blanched almonds, grinde them and drawe them up with water. Set them on the fire and seethe the jowtes with the almond milk, and cast thereon sugar and salt, and serve it forth. 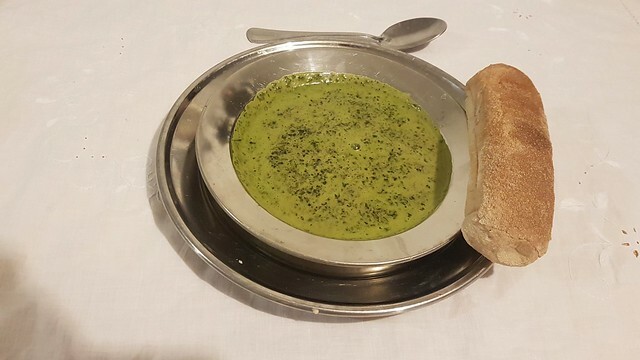 A soup like this would have been served on less formal occasions, however the almond milk gives it a touch of luxury and expense that would have put it beyond the reach of most people. To make the almond milk, soak the almonds in the water for several hours. Put the almonds and water in a blender, and blend on high speed until the almonds have been reduced to meal and the water is cloudy. Strain the almond milk. You can use the left over almond meal in a pottage, or as a filling in a tart. However it will not have much flavour. Set the almond milk aside. 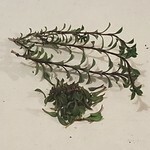 Remove any thick or tough stalks from the leaves. 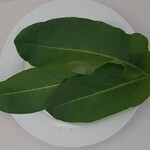 Put the leaves into a pan with a small amount of water. Steam the leaves until they have wilted. Add the blended soup to a pan and bring to the boil. Add the sugar and salt, and stir well to mix. Can be served hot, or at room temperature. 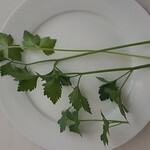 “Jowtes” is another word for pot herb, or herb that gets added to the pot to be eaten cooked. (Hieatt and Butler, 1985, 196). 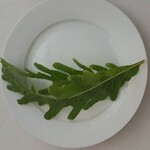 Because I have a garden with many medieval plants that aren’t commonly available, I was able to use a large variety of different leaves in my green soup. 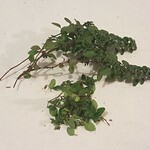 I was able to use chard, sorrel, wood avens, horseradish leaf, borage, wild celery, winter savoury and wild thyme, as well as more common herbs parsley, chervil and sage. 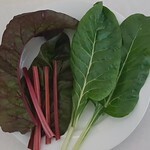 If you don’t have access to a wide range of interesting medieval leaves, I would suggest using silverbeet, beetroot leaves or turnip leaves. Or possibly even kale, but I really don’t know why you’d bother. You may think it odd to use cold water rather than hot to make the almond milk. The resulting milk has a far stronger flavour, as the flavour is not evaporated out as steam, which is what happens when you use hot water. It is far better to make your own almond milk rather than bought almond milk, as the flavour is far better. However use the blanched almonds rather than almond meal, as almond meal loses much of the essential oil when it is ground and stored, and that’s where the flavour comes from. In period a mortar and pestle would have been used to reduce the jowtes to a paste so they mix with the almond milk better; this is probably why they were boiled first. The soup here has a slight red tinge from the chard. 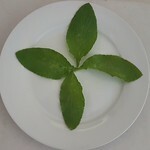 Using different leaves produces different coloured soup. Tak þe two del of rys, þe thridde pert of almoundes; | wash clene þe rys in leuk water & turne & seth hem til þey breke & lat it kele, & tak þe melk & do it to þe rys & boyle hem togedere. & do þerto whit gres & braun of hennes grounde smale, & stere it wel, & salte it & dresch it in disches. & frye almaundes in fresch gres til þey be browne, & set hem in þe dissches, & strawe þeron sugre & serue it forth. Utilis Coquinario 28, (MS Sloane 468, in Curye on Inglysch, ed. Constance Hieatt and Sharon Butler). Take two portions of rice, and a third part of almonds. Wash the rice in lukewarm water and cook it until (the grains) break, then let it cool. Take the milk (of the almonds) and add it to the rice, then boil them together. Add white grease and minced chicken meat, then salt it and put in dishes. Fry almonds in fresh grease until they are brown, and set them in the dishes (on the rice and chicken), then sprinkle on sugar, and serve it forth. Blawmanger, or “white food,” was extremely popular throughout medieval Europe; the Concordance of English Recipes lists over 20 recipes from the 14th to the 15th century in England alone. It consisted of rice and ground chicken, sometimes with added pork, and there were Lenten versions with fish in place of the chicken. The dish continued to be served beyond the medieval period. Gradually, however, the meat disappeared and extra sugar was added, until the modern “blancmange” emerged. It would have been an expensive dish – rice was an imported luxury, as were almonds and sugar. The existence of Lenten versions also indicates its popularity and importance as a medieval dish. Rinse the rice in cool running water until it runs clear. If you catch the rinsing water in a bucket, it goes well on the garden. Cook the rice in boiling water until it is very soft and mushy. Remove from the heat, drain off any excess water, and allow to cool. While the rice is cooking, make the almond milk. Steep the almond meal in boiling water for approximately 15 minutes, stirring regularly, then pour it through a cloth lined strainer. You need about 300mL for the finished blawmanger. Mince the cooked chicken, and set aside. Add the almond milk and some of the lard or chicken fat to the rice until the rice is just moistened. Return to the heat and stir well, until the rice is completely warmed through. Add the minced chicken to the rice, and stir well. Remove from the heat – the residual heat in the rice will warm the chicken. Melt the rest of the lard or chicken fat in a pan, then add the whole or flaked almonds. Fry until they are golden. Pour the blawmanger onto a serving dish, then sprinkle the fried almonds and sugar on top before serving. It can be eaten hot or cold. When making this dish, I use 500g of chicken thigh, which I poach. I then cook the rice in the poaching water to boost the chicken flavour. I prefer chicken thigh to chicken breast, as chicken breast can dry out too much, and does not mince as well. Don’t try making this dish with raw chicken mince which you then cook – the mince clumps together while it is cooking and is difficult to distribute through the rice. I use an electric mincer to mince the chicken. You could also use a food processor, but be careful not to process the chicken to mush. However, meat can also be finely minced with a cleaver, as demonstrated in this YouTube video. Rinsing the rice before you cook it washes excess starch from the rice, and the final result won’t be gluggy. It also tends not to stick to the pan while it is cooking. I have seen other modern versions of this dish where the rice is cooked to a modern preference, that is, still slightly firm, or “al dente.” However, the recipe specifies that the rice should be cooked until the grains break, which I have interpreted as cooking the rice until it is completely soft and mushy. 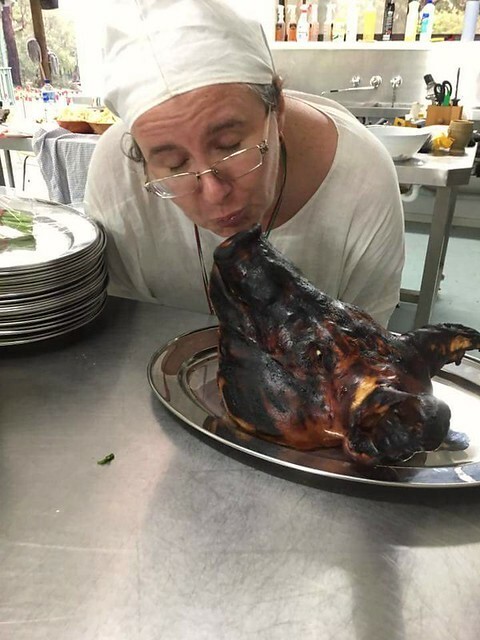 At a recent feast I ran, I decided to serve a pig’s head breathing fire as a spectacle at a feast. I had never cooked a pig’s head before; and I wasn’t sure how it would be received. However when I mentioned it to people they got very excited so I decided I had to go ahead with it. The first issue I had was obtaining a pig’s head. They aren’t commonly asked for, after all. However the butcher I go to for events was able to source one, and didn’t give me too weird a look; it’s not the strangest thing I’ve asked him to get for me. The word got around the event that there would be a pig’s head and a few people came to meet it, which is how the head acquired the name Bernàrd. 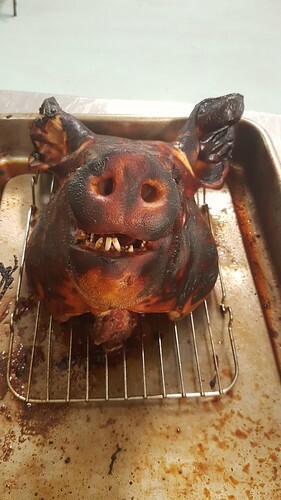 I’ve never cooked a pig’s head before, and in the end I decided roasting was my best option. I knew how to roast pork, and I figured a head would roast pretty much the same. But I honestly didn’t think anyone would want to eat it – I just thought people would simply look at it, enjoy it, and that would be it. So I didn’t pay too much attention to the preparation. I simply gave Bernàrd a wash and patted him dry, then rubbed him with a commercial barbeque sauce to give him some colour. Unfortunately the spill I had prepared to stick in his mouth and light, so he appeared to be breathing fire, became too damp and simply smouldered. So he was sent out nibbling on some parsley. And he came back with no meat left on his bones – virtually everyone at the feast wanted to try a piece of Bernàrd, and the queue went out of the hall. There were even fights about who got the last of the cheek. I will certainly be serving a roast pig’s head once again. However next time I will be using a more period appropriate glaze, such as a Lumbard Mustard. If you want to cook a pig’s head, you will probably need to order one specially from the butcher (be prepared for some strange looks). Make sure you specify you want it whole, with the ears, cheeks and snout attached. They roast just like normal pork, but take longer than a boned, rolled joint, as the bone acts as a heat barrier. I would also wrap the ears and nose with foil during the cooking, because as you can see Bernàrd’s wound up getting a little too crispy. And probably get someone else to carve, because a pig’s head ain’t the easiest thing to carve.